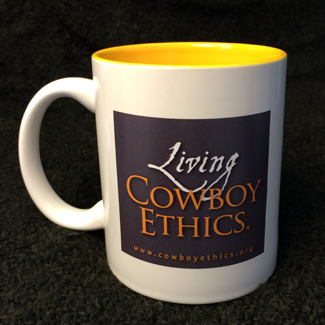 The LIVING COWBOY ETHICS mug is here! 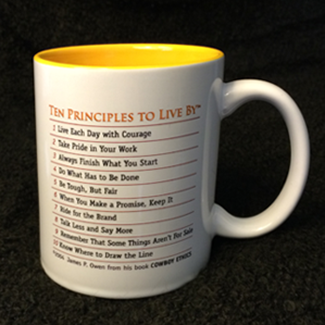 The front lets everyone know you are Living Cowboy Ethics while the back proudly shows the 10 Principles to Live By. This beautiful ceramic mug is BPA free with a splash of color on the inside. It holds 11 ounces of your favorite beverage while keeping it hot or cold. These mugs are available for $12, plus $5.50 for handling and shipping via standard USPS. To order simply click “ADD TO CART” and input the number you would like. Larger orders are available at a discount. For more information, or if you are ordering from outside the USA, please contact the distribution center HERE or call (323) 876-4808 or fax (323) 876-4545. Additional shipping fees apply to international orders.